Have you guys heard of Free Crappy Portraits? The name basically sums it up. In the end, you get a free crappy portrait. Although, I don’t think ours is crappy at all. I think it’s pretty amazingly awesome. The process is pretty simple. In an email, attach a photo, tell them about yourself or whoever is in the photo, send it off, and wait. Here’s the photos and information I sent them. We’re Chelsea and Brad. We were married on June 25, 2011. 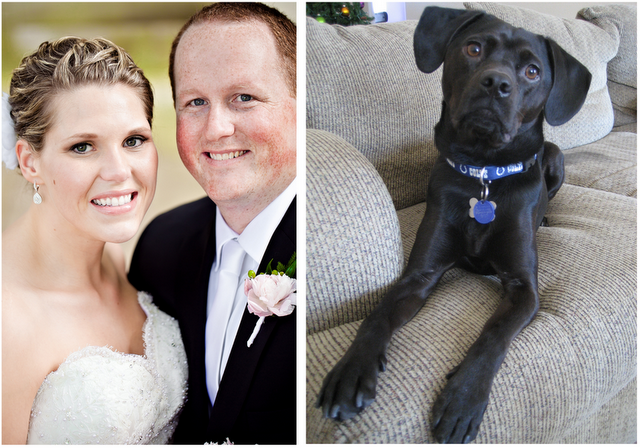 All of our family was at the wedding, except our beloved dog, Jack (dogs weren’t allowed at our venue). A little about us: Chelsea loves photography, blogging, DIY projects, and traveling. 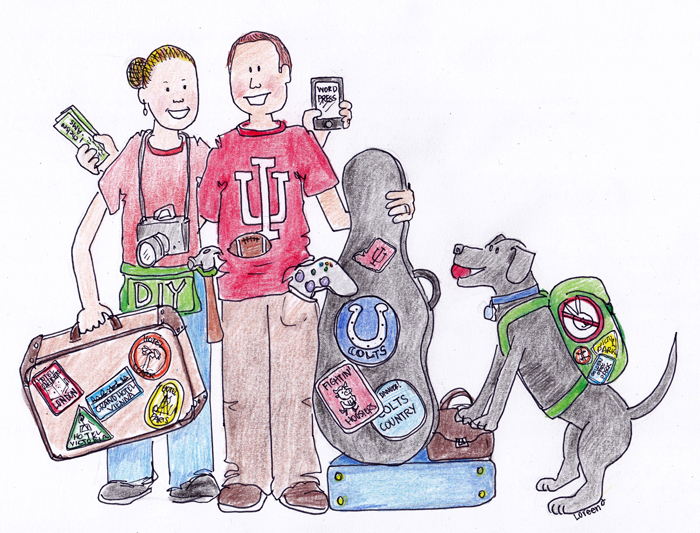 Brad loves his guitars, xbox 360, watching football (specifically Indiana University and the Colts), and traveling. Jack loves his big red tennis ball, chasing rabbits, walks in the park, and napping. Seriously, you need a free crappy portrait. Go get one. Now. What do you think about our portrait? Spectacular, right? That is awesome! I have never heard of these, but yours is great! I may have to try this. how long did it take, I submitted forever ago! Did they email you or did you have to keep checking the site? Yours came out very good! LOVE your portrait! It turned out cute and really looks like you guys! That’s so cool… yours turned out great! What a fun idea! I like your portrait!! OMG this is SOOO cute! Now I want to try!! Ummm, I love this! Thanks for sharing!! ok, so your pic is not crappy at all! I love it! I was all psyched to do this, then I went to their site and the majority of them are crappy haha you got lucky!